It's ownership change number nine (we think) for Toronto's storied music venue the El Mocambo. After less than a year at the helm, Sam Grosso, owner of the Cadillac Lounge, has decided to sell his stake in the business, calling it a "decision that has been weighing on me for some time" in a statement on Facebook. The shake-up leaves Marco Petrucci, the owner of 99 Sudbury, the sole owner of the El Mo while major renovations take place. "I thought we'd be able to maintain three to four days a week booking bands or events and then renovating the second floor as we're operating on the ground floor," says Grosso, admitting the improvements the pair promised when they took on the venue last summer will require a total shutdown, a move he can't personally afford. "I didn't have the finances to pay a mortgage, insurance, property taxes, hydro, and gas bills, and then on top of that do major renovations," he says. Grosso will focus on running the Cadillac Lounge and spending more time with his children. One estimate puts the closure at between eight and ten months, though it's not clear exactly how long it will take to carry out structural repairs, replace the stage, build a new rooftop patio, and make cosmetic improvements, including a new bar. Bands that were booked for the coming weeks will be accommodated at one of the pair's other venues, Grosso says, but there are no guarantees all of the acts will be flexible enough to move. The El Mo opened in 1948 and established a reputation as a live music venue in the 60s and 70s. 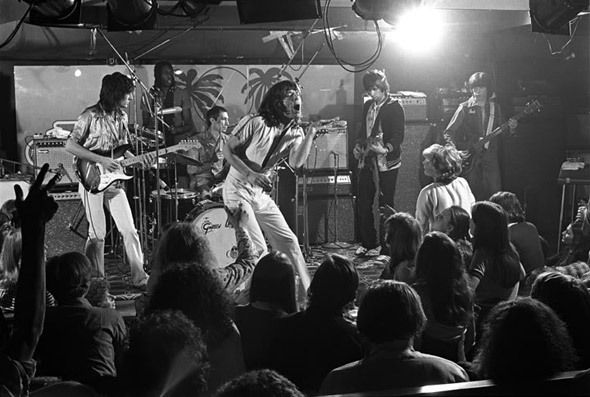 The Rolling Stones famously played there under the stage name The Cockroaches over two nights in March 1977. Debbie Harry and Blondie, The Ramones, U2 and Billy Idol have all packed out the two-floor Spadina Ave. building at the peak of their fame. In recent years the space had fallen on hard times. Before Grosso and Petrucci took over, owner Abbas Jahangiri had tried to convert the upper floor into a dance studio. Before him, the Stones were famously prevented from reprising their famous appearance by the El Mo's strict indie-only policy. One of the most noticeable changes made in the last 12 months was the $20,000 restoration of the famous tropical sign by local glass worker Grant Farrell, one of the few neon artists in the country. "I'm very proud of the 10 months I was there - I think I put a little bit of a footprint on the place. I know everybody in the city was very, very excited about it. Every time I walked somewhere it was like 'Hey, how's the El Mocambo going? You're the guy that's going to do it!'." "I felt like someone was putting another log on my shoulder," admits Grosso. "As they say in the Italian culture, 'family first'." Image: El Mocambo, Chris Luckhardt/blogTO Flickr pool.